The 100m sprint is one of the most important events in track and field. The mens' winner of the 100m dash at the Olympics is crowned with the unofficial title of the "world's fastest human" and is celebrated for his accomplishment. Women sprinters are also held in high esteem. This race requires explosive speed, excellent quickness and nearly perfect technique. In order to build explosive running strength, sprinters do interval training to get faster. Start off by sprinting 400m and then follow that with a 200m sprint. Then do a 100m sprint before closing with a 50m run. All four of those races help sprinters gain endurance, improve technique, build speed and get quicker. Take a two-minute break after completing the four sprints and then repeat the drill. One of the best ways for a sprinter to gain speed is to do parachute training. A running parachute provides resistance to the runner and forces him to work harder when running. The running chute is worn like a back pack. Attach the running chute and take off when you hear the coach's signal. As the chute unfurls, continue to sprint without slowing down and while maintaining as much speed as possible. Then go back to the starting line and do the drill again but when you get to the 50m mark, press the release button on the chute. As the chute drops off, you will get a surge of speed. 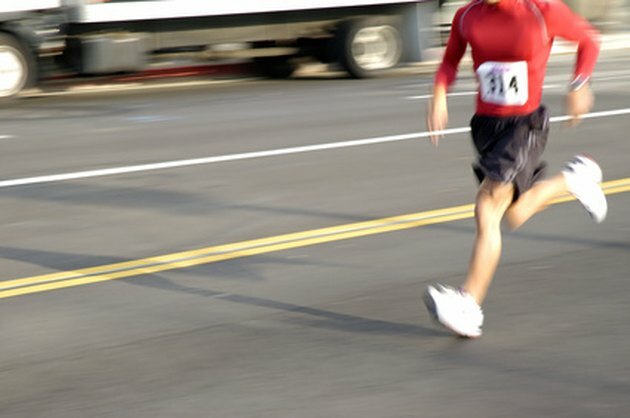 This is called "overspeed" and it will help you become a more explosive runner. In this drill, you will work on your technique in the starting blocks. The sprinter's ability to get out of the starting blocks and up to top speed quickly is vitally important. In this drill, you will practice your start to help you get out of the blocks quicker. Practice starting and sprinting the first 20m of the race and then go back to the starting blocks until you have done this drill 10 times. What are the Rules for the 100M Sprint?